Ever wished for a booster shot that would prevent your skin from aging? We might have found one. Niacinamide is a powerful, skin transforming ingredient that works in many different ways to reverse aging processes and repair damaged skin. The resilience seen in younger skin is restored after niacinamide is introduced into the skin. 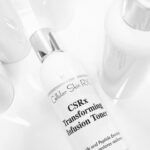 CSRx Transforming Infusion is a 10% Niacinamide Concentrate that can be used alone or added during application to any Cellular Skin RX serum, complex or cream. Easily penetrate the skin in significant concentrations to a deeper level. Have a known scientific mechanism of action. Show clinical significance in published, peer-reviewed journals. Niacinamide meets these standards easily. It is an exceptional skincare ingredient when used in concentrations of 2 to 10%. Our CSRx Transforming Infusion includes the highest concentration: 10%. Why don’t you see it used more often? Because it’s expensive. But it’s well worth it. How does niacinamide transform your skin? Easily penetrates the skin where it is converted into NAD (nicotinamide adenine dinucleotide) NAD is a cell-signaling coenzyme that our cells use for DNA repair, improving energy metabolism and stimulating key proteins and hormones that prompt healthy collagen production. Down-regulates protein glycation. Glycated cross-linked yellow-brown proteins make skin appear sallow. Niacinamide stops defective, brittle, cross-linked collagen and elastin from being deposited in the skin. When these deposits do occur, they reduce flexiblity and elasticity of the skin and wrinkles form. Skin is noticeably brighter and resilent after regular niacinamide use. Down-regulates the release of melanosomes in damaged skin so age spots are eliminated. Up-regulates lipid production (especially ceramides) to prevent compromising of the skin’s lipid barrier. Increases production of critical cell proteins to maintain the barrier function. Increases healthy cell turnover and proliferation. Skin retains more moisture and is able to repair itself. Fine lines disappear and wrinkles reduce over time. Regulates sebum production for less frequent acne breakouts and smaller pores. Restores skin cells’ natural energy repair processes after damaging events such as UV exposure. Reduces skin sensitivity. Redness and irritation are reduced. Overall texture is improved. Don’t forget this exceptional concentrate can be used alone or ADDED during application to ANY CSRx serum, complex or cream. Niacinamide works synergistically with vitamins C, E, and A (retinol). Adding this infusion to our other products is the booster shot you’ve been looking for without adding another layer to your skincare routine. In the palm of your hand, mix a few drops with any of our serums, complexes, or creams and apply as usual. Does not make skin sun sensitive. However, we recommend daily sunscreen use year-round. Clinical support for Niacinamide can be found HERE. Alone – After any antioxidant product, apply a few drops to face and neck. Follow with proper moisturizer if needed and daily sunscreen. Addition to CSRx products: Add a few drops in the palm of your hand. Add the serum/complex/cream. Mix together then apply as usual to face and neck. Follow with proper moisturizer if needed and daily sunscreen. In the EVENING, use same as noted above but omit sunscreen use. While CSRx Transforming Infusion 10% Niacinamide Concentrate can be used alone on cleansed and toned skin, it will combine to provide exceptionally visible results with our vitamin C+ Firming serum, F*a*C*E Synergy serum, and/or CSRx Retinol Peptide Resurfacing Complex. In the palm of your hand, add a few drops of each product, mix together then apply. 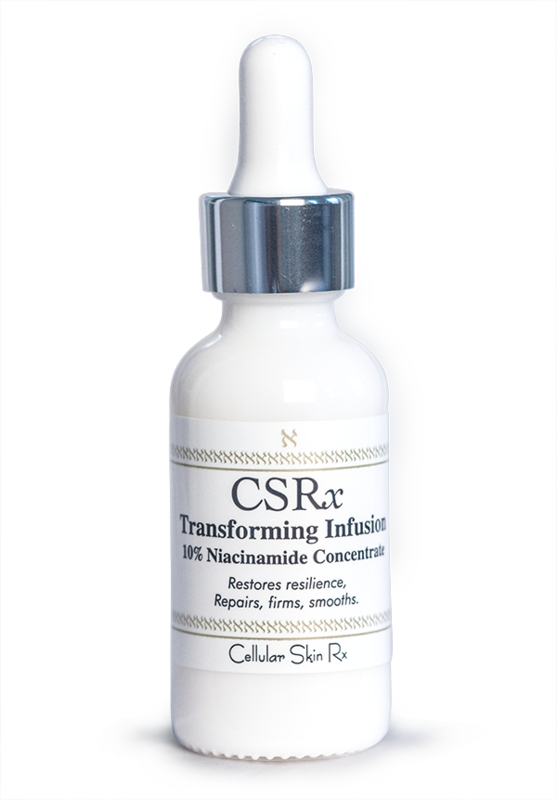 Can be used to enrich any CSRx product with Niacinamide. DO NOT ADD DIRECTLY TO ANY OTHER PRODUCT CONTAINER. Mix a few drops with any other product in the palm of your hand then apply. An amazing product! I think this may be the product that has done the most for my skin, ever. Results were visible from day one. It enhances the glow from C+ and adds overall firmness. Having used it for only a few days now, it’s already my #1! Thank you for the review, Fred. I agree! After years of using our C+ Firming serum and all of our other products, the addition of this one to my routine created remarkable results. Now, if we could just get ALL of our customers to make the leap and add this to their routines – I think they would be amazed. Thanks, again for the review. We appreciate it.